Just a 5-minute walk from the old town, Albergue Internacional de Teruel City Backpackers offers comfortable rooms, single beds in dormitory rooms as well as free Wi-Fi throughout. 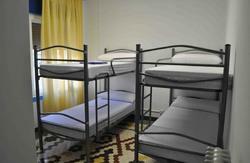 Rooms are bright and spacious and offer access to shared bathroom facilities. Some rooms also have a private bathroom. Lockers are available. This modern hostel has a tour desk with tourist information about the area. Here, guests can also buy tickets to visit Teruel’s main tourist attractions, the Dinópolis Theme Park or ski passes to Valdeninares or Javalambre ski resorts. Other facilities at this hostel include a café-bar, a small library, board games and billiards amongst others. Teruel Train Station is 10 minutes’ walk away. Cancellation Policy : 7 days advance notice or the first night will be charged as penalty. Cash , credit and debit cards payment accepted on arrival. Check-in time : 13:00 - 00:00. Check-out time : 11:00 am. Breakfast not included( offered for an extra charge). Linen included (not included for our Deal Bookings). Towels for hire (2,50 EUR). Arriving by bus: Exit the station and turn left, go straight. Cross the bridge. Once across the bridge, we passed a gas station and 100 meters on the left is the street Segorbe. 10 minutes walk from the bus station to the hostel. Arriving by train: we left the station and next in the park there are stairs there (next to the stairs, there is a free lift to climb). When you go up the stairs, turn right and walk three minutes to the park 'La glorieta'. We crossed the pedestrian bridge there. When we cross the bridge we walk down the main street 200 meters, pass a gas station and 100 meters on the left is the street Segorbe. 15 minutes walk from the train station to the hostel.